The year was 1992. The Penguins entered the season as back-to-back Stanley Cup champs. They had the best player in the game. With 56 wins and 119 points, they not only ran away with the Patrick Division but won the President's Trophy as well. 17 straight games were won, a record that still stands today. They had two 50-goal scorers and five 30-goal scorers, as well as four players with at least 100 points. Enter the 2012 Pittsburgh Penguins. For the first time in over two years, the Penguins entered the season with Crosby and Malkin 100% healthy. It was a lockout shortened season, which many thought would play right into the Penguins' hands, as they seemed to get run down in the playoffs over the last few seasons. In March the Penguins strung together 15-straight wins, good enough to tie for second in NHL history. Their roster seemed to be loaded with talent, and then Ray Shero decided to make a few acquisitions. He signed the Dallas Stars captain, Brendan Morrow. Then he proceeded to address the team's defense question mark by bringing in some grit with Douglas Murray. When everyone thought the Penguins were done, Shero struck a deal with Calgary in the final hours of the trade deadline to acquire their team captain in Jarome Iginla. "True to form, the only team that can beat the Penguins are the Penguins." On paper, these Penguins seemed destined to win their second Stanley Cup in the past five years. 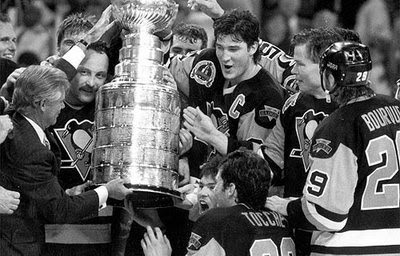 Flash back to the 92'-93' Penguins. It is the start of the playoffs. The Pens win their first three games against the Devils in the Patrick Division semifinals, extending their playoff winning streak to 14 games, which started in the 91'-92' playoffs. After dropping game four, they went on to win the series with ease, 4-1. Enter the New York Islanders. During the regular season, the team finished tied for third in the Patrick Division with the New Jersey Devils, 16 wins behind the Penguins. It seemed like a severe mismatch on paper. When David Volek scored the overtime winner for the Islanders in game 7, it was over just that quickly. We all know what ultimately happened to the Pens this past year. They ended up leaving the playoffs sooner than expected and came up empty in their quest for the cup. It could not have ended in a more disappointing fashion, being swept by the Bruins and only scoring two goals in four games. It left fans scratching their collective heads. How can a team that is so star-laden with the top scoring offense, on paper, perform so poorly against the Bruins? Some popular responses included: Bylsma doesn't know what he is doing, Shero messed with team chemistry, our defense played poorly, you can't win when you lose the special teams battle, and so on. These responses by the fans, myself included, are normal. When the Penguins were on a 15-game winning streak, no questions were being asked, but when things go poorly, all of a sudden there are more problems than positives. In hockey, more so than any other sport, a hot player or two can lead an "underdog" on paper past the so-called favorite. No one expected Tuukka Rask to play the way he did for the Bruins throughout the playoffs. It happens sometimes. So, I ask all Penguins fans to remember this article next May. We all know Ray Shero and the front office will do everything in their power to put the team in the best position to win a Stanley Cup. They will be near the top of the Eastern Conference on talent alone, and with any mid-season acquisitions, they may even be the favorite to win the Stanley Cup -- say it with me -- on paper. Like the fans were in 1993, don't be upset with the players, coaches, or front office if the teams falls short again this season. As with all things in life, nothing is guaranteed. There are too many variables that go into a team's ultimate success. So remember, enjoy these Penguins. Be excited when they are winning. Be disappointed when they are losing. Just don't feel like anything is a given because on paper favorites don't win automatically. They still have to go out on the court, field, or ice and have a little luck on their side.